It’s been a long time since I’ve posted some room pictures on this site; sometimes I forget that collecting interior inspiration was how my blog got its start. So I’m getting back to my roots today to share a gorgeous kitchen from Country Living. Open shelves styled with white dishware gets me every time — I love how functional this kitchen looks while still evoking such style. 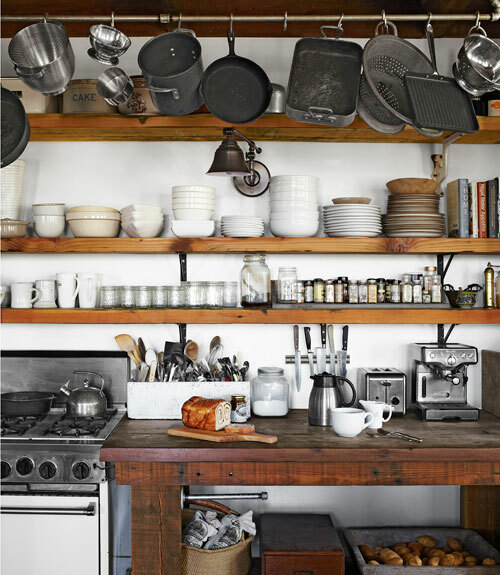 What do you think, are you into open shelving in the kitchen? Black and white ribbon. Bright and bold. 3 Responses to "Out in the open." i do like the look… however, i know i could never execute it without it looking just like big piles of trash all over my house! love! This is the reason I strictly buy white ceramic dishes and bakeware! I am weary of the open shelving because I am so unorganized with the dishes. I would need a whole new system, but I think they are so good looking.